What if biologists researched only flowers, or physicists only outer space? It’d be ridiculous. Something akin to this kind of single-issue madness operates in the economics profession. The Economist reports that economics journals focus almost exclusively on the United States. 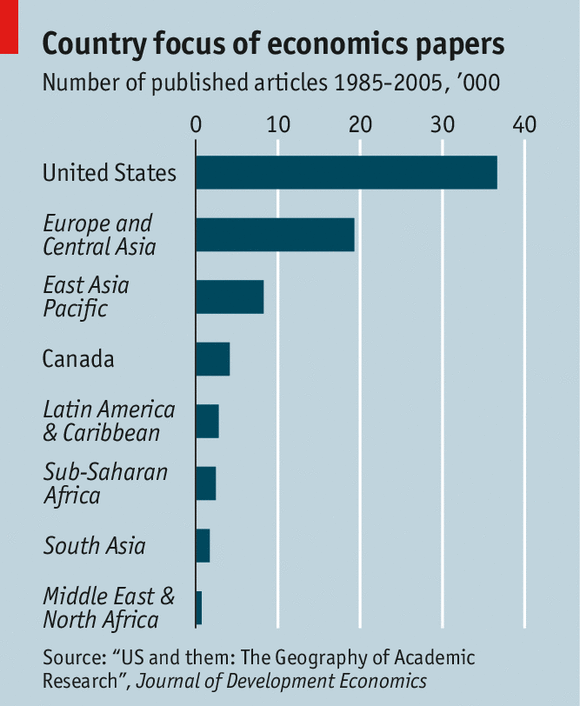 A sample of 76,000 papers published between 1985 and 2005 shows that were more papers about the United States than on Europe, Asia, Latin America, the Middle East and Africa combined (as the Economist’s chart shows below). The imbalance is even more marked for the top five economics journals. Academic economists almost totally ignore the poorest countries. In the 20 years concerned, only four papers were written about Burundi. The American Economic Review, the fulcrum of academic desire, published one paper on India every two years. The Economist explains this one-sidedness partly by saying that loads of data exists on America so it’s easier to crunch the numbers. Poorer countries aren’t so lucky. But that’s like saying oceanographers should ignore the deep ocean because they haven’t been able to explore it yet. In fact the deep sea is considered one of the last frontiers and scientists are doing all they can to understand it better. The data obsession of economics highlights one of the main problems of the discipline – its positivism gone loopy. The idea that if something can’t be disproved (and hence measured) then it isn’t science is ludicrous. It would mean that we could say very little about love, friendship or social bonds in general, all of which have important implications for economic behaviour but which are nebulous and difficult to capture in numbers. Just because poor countries aren’t bulging with reams of data it doesn’t mean they’re invisible. This sort of scientism in effect amounts to the wielding of power. ‘We’ as western academics will develop complex techniques which frame the debate because they only ask certain questions – how big should be the public debt to GDP ratio, does government spending crowd out private investment – and then we’ll analyse these issues to death without considering anything that people in poor countries might care about. Economics thus becomes by definition the study of rich countries. Lots of research techniques and modes of analysis exist on subjective behaviour, and information can be uncovered if you look for it. Anthropologists have long studied subaltern societies using fieldwork complied over years of immersion in the community. Much blame for the statistics-mania of economics can be pinned on Paul Samuelson, whose notion of operationalism amounted in effect to the economists’ version of positivism. As Bertrand Russell pointed out, the core principle of logical positivism is self-contradictory because it can’t be disproved. The Economist cites another explanation for economists’ bias toward the States: that the intellectual kudos in solving a problem about the American economy is much higher than understanding a less developed country. But if economists are so career-obsessed that they’ll ignore the rest of the world then they should be pulled down a rung or two. Countries and people should be much more important than the mathematical games played out in the supposedly top journals. It’d be interesting to know which journals the study covered, because if you look hard enough there is in fact a fair amount of stuff written about poor countries – it’s just outside the big name journals. As Paul Krugman has recently said, some of the best economics is happening on blogs (no, not this one), in working papers and in online journals like that of the World Economics Association. The biggest problem with the US-centric nature of economics is that the profession has a universal view of human beings as self-interested, utility-maximising, optimising and broadly rational, when such a view of humanity is only one among many. Economists think that if they hone their techniques in the laboratory of America, then they don’t need to look further afield. But America isn’t a laboratory; it’s a small corner of the world, albeit a powerful one, and one where things work in a peculiar way. Humans don’t behave the same everywhere. In none of the 23 countries I’ve worked in does homo economicus exist. In the broadly subsistence societies of Melanesia, for instance, many people explicitly repudiate the materialistic aspirations of foreigners, having the self-knowledge to realise that televisions don’t make you happy. It would be laughable to describe the inhabitants of Tanna, one of the southernmost islands of Vanuatu, as consequentialist in the economist’s sense, trading off future expected utilities against one another. There, communities are more important than individual “rights”. In countries like South Sudan and Lesotho, “the state” can’t be conceptualised as the black box that economists think it can. It’s a varied and complex beast, riven with tribal and special interests – as seen lately. It doesn’t behave remotely in the way that it is imagined that the American state does, as a technocratic institution which is supposed to intervene (or not) according to circumstance. Economies themselves are rooted in social structures, all of which vary because of history and culture. Even in the United States and Europe, the old notion of strict rationality has come increasingly under question as a result of new research by psychologists. So for economists to focus only on America is as partial as if biology looked only at floriculture, or as if physicists gazed just at the heavens, and omitted the vast and fascinating research space that exists in the rest of the world. We’d be outraged if any other science was so blinkered. Why not with economics? I half-agree, in that economists should hugely rebalance their research. But at the same time without a major overhaul of the techniques and methods of economics I’m not sure I want them to poke around more in poor countries because they might make just as much a mess of things as they have in the rich world. Your last paragraph captures the essence of my concern: a focus on the United States entails a one size fits all approach by economists to development (e.g. ‘free’ trade, open capital markets, flexible labour markets) that is devoid of political realities and pays lip service to the role of institutions and history. It also implicitly assumes that the United States took that development path which anyone who has studied American capitalism and development knows to be untrue. I don’t take the work of the so-called New Institutionalist school seriously despite the publicity surrounding Acemoglu and Robinson’s work. The blogosphere, while more dynamic, remains full of self referential tripe with individuals talking past each other about economic models as if those neoclassical abstractions have semblance to reality. Krugman is part of the problem rather than the solution. He remains (by far) the most popular blogger and has some ideas that I am sympathetic to but is as intellectually rigid as his detractors. I agree with you but there are some heterodox blogs — see my blogroll for a few. Krugman is interesting because of the regularity of his output and, as a neoclassical, his occasional references to outsiders like Kalecki and Minsky. But you’re right — in essence his theoretical framework is redundant and his public comments don’t always have much to do with it. There are many things in our world today where we are made to think that “if it was not done in america or done by an american then it did not happen”. I am a Kenyan, so if that article said there were only 2 articles published about Kenya, the more fundamental questions is not why american economists are not researching about Kenya, I would rather ask ” what are the Kenyan economists researching about if not Kenya?”. I am currently researching on a very similar issue out of curiosity. I read an article by 2 prominent American writers in the field of evaluation which said that “there are no evaluation theorists or thinkers in the global south”. This basically means other than america and Europe, no one in the rest of the world is theorizing, thinking and researching on program evaluation. So I am interested in finding our who in America and Europe have been theorizing, thinking and researching about program evaluation? It turns out that it is sociologists, economist, psychologists etc who are interested in studying the impact of various programs. So my current step in this curiosity is ‘of all the sociologists, economists, psychologists etc studying/teaching in all the universities in the global south, isn’t there any of them interested in program evaluation theories?”. or is it that if it is not done by an american, in an american university, then it didn’t happen? Hi Grace, I fully agree with you that academic research and many other things are far too US-centric. That’s how power works. The American Economic Review, of course, publishes research by economists of all nationalities, so the question isn’t so much one of the nationality of the researcher as the worldview and methods of the journal. I’d imagine that there are many people in the global south who think about programme evaluation. What’s important is not to uncritically take onboard the assumptions and unspoken framework of those who discuss programme evaluation. As I say in the blog, most societies can’t usefully be analysed or discussed using the version of utilitarianism employed by economics, so for the ‘insider’ like you, it seems important to think about how to evaluate programmes on your own terms, or from the perspective of the society or process you’re examining. Otherwise you’re ceding control of the debate from the start, and your answers won’t necessarily be as useful as they might be.